Bill Goodwin interviewed February 2011. 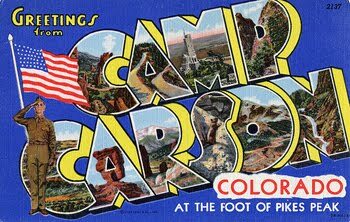 In 1951 Bill Goodwin was serving at Camp Carson (later Fort Carson), in Colorado Springs. When his hitch was over, the Tennessee native and his new wife went back to his home state, for his next career move. “When I got discharged from the military, I went into this government program that retrains you for a private sector job. I wanted to be a journalist. So I went to work at a local newspaper (Henderson Star News), and stayed there for eight years." About that time his wife longed to come back to Colorado – so the couple packed up and moved back to her hometown, Cañon City. There he found a job as the advertising manager at the local newspaper. While writing story leads and ad copy paid the bills, Goodwin started to segue his talents into song composition. 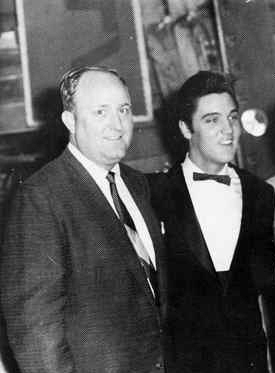 In 1957 he decided to cut a songwriter demo – something to hand out to performers, highlighting his lyrics. The session would produce two singles on the Mystic label (part of the Starday package)“I’ll Stand the Line” and the flipside “So Wrong” (Mystic 679), “Angel in Disguise” / “It Don’t Cost a Dime to Dream” (Mystic 689). While the singles would not receive any radio airplay, Goodwin was now bit by the performing bug. He put together his own band, the Western Ramblers. The following year Goodwin released the rockabilly “Teenage Blues,” and the flip “Second in Your Heart” (Starday 710), and “Your Lying Ways” / Will You Still Love Me” (Dixie 2015). In 1962, the group recorded a series of singles for Vicky Morosan’s Denver-based Band Box label including the George-Jones penned "Revenooer Man" (misspelled on the label as “Revenuer Man”) /” Too Many Heartaches” (Band Box 287), “Those Same Old Heartaches” /”Pardon my Tears” (Band Box 293), “Heartaches” / “Don’t Take My World Away” (Band Box 309), and “You Did This to Me “/”Making it Easy on My Heart” (Band Box 323). 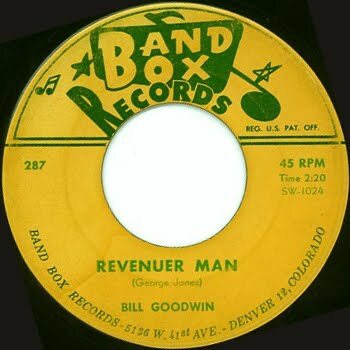 The discs were backed by Goodwin’s next band, The Country Tunesmen. “I never even got to first base with those Band Box records,” he admitted. By then his marriage began to fall apart. After his divorce, he left Cañon City, based himself out of New Mexico, and toured the country. Pueblo performer Warren Robbe was the opening act on the bill (NOTE: Warren Robbe interview in the next issue of Pueblo City Limits). The Country Tunesmen would also appear as the backing band on Warren Robbe’s own Band Box recording “I’ve Had My Chance”/”Life’s Not Worth Living” (Band Box 303 – 1963). In 1963, Goodwin signed with husband and wife Vivian Carter and James Bracken’s Vee Jay records. The duo, who had previously been known for releasing only R&amp;B recordings, had just inked a deal for the distribution rights to The Beatles, and The Four Seasons. By 1963 they expanded their catalog to include country acts such as Mac Davis and Vernon Stewart. “Bob Luningham of Farmington NM is handling the bookings of Bill Goodwin and His Country Tunesmen, who have been keeping busy in the Southwest the last two months. Bob is also handling the promotion of Goodwin’s new Vee Jay recording “Shoes of a Fool” – Billboard, May 11, 1963. 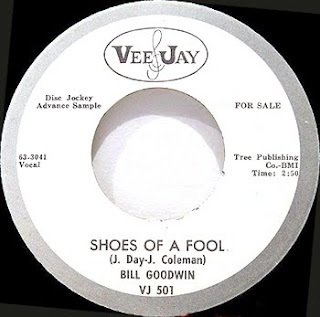 In May 1963, "Shoes of a Fool" (Vee Jay 501) made its way up the Top 20 charts, sandwiched in between Patsy Cline's "Sweet Dreams," Bill Anderson's "Still," and "Act Naturally," by Buck Owens. 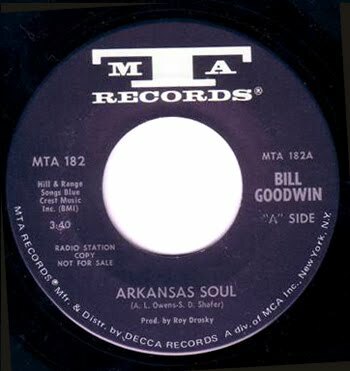 Goodwin would go on to record a handful of other singles for the label, including "I Won't Wait Up Tonight"/"The Stand In" (Vee Jay 564), and "The Saddest Eyes"/"The House at 103" (Vee Jay 602). With major label representation under his belt, he decided to move to Nashville, where he had access to local, influential radio stations - as well as the movers and shakers of the country music scene. During this time he married "the love of his life," Elizabeth Ann McGrady. "We just celebrated our 48th wedding anniversary," he said. Goodwin would leave Nashville, for the Great White North, to record an LP for the ARC label, Walk Through This World With Me (ARC 717). "I forgot about that album," he said. "I recorded it in Canada, with a Canadian band - it was an one album deal." The Toronto-based ARC label was founded in 1959. The label was mainly known for recording local artists, but by the early 1960s, it contracted with Hit Records of Nashville to produce its own Hit Parade series. Anne Murray recorded her first LP, What About Me, with the label, in 1968 (ARC 782). 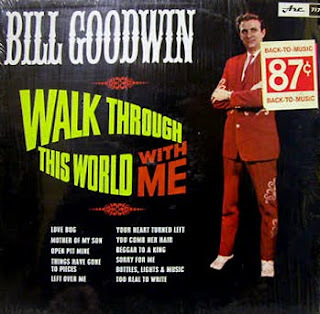 For the next several years Goodwin toured the country, eventually signing with the MTA label in 1967 - joining the ranks of Roy Drusky, Frankie Roberts, and Gene Crawford, who were also under contract. There, he recorded a number of singles including "Johnny Fast" (MTA 124), "I'm the Most Successful Failure" (MTA 133), "Lonely Rider"/"Theme from Will Penny Condition" (duet with Sharon Roberts - MTA 139), "Top Dog" (MTA 144), "Empty Sunday Sundown Train"/"Shoes of a Fool" (MTA 163), and "Arkansas Soul"/"Shoes of a Fool" (MTA 182). "After MTA, I guess this was around 1971, I just got out of the performing business," he said. I was being booked by Hubert Long (Stable of Stars) back then, and one day I just told him that I was quitting - I was sick of it." But instead of walking out the door, Hubert Long offered him a job. "He made me executive vice president." Just one year into Goodwin's new job, Long died. While a few of Long's clients moved on to other representation, Bill Anderson, Roy Drusky, Leroy Van Dyke, Billy Walker, and Jean Shepard approached Goodwin with an offer - open up his own agency, and they would be his first clients. So he did. "It was interesting work, but it wasn't an easy job. To be honest, it's kind of like a babysitting job," he said. "But it was a pleasure, since they were all my friends." The Bill Goodwin Agency would stay in business until 1985, when Goodwin decided to retire. At 81 years old, he still has ties to Colorado. Until recently he maintained a second home in Colorado Springs, and his daughter lives in Cañon City. "We don't have country music now - it's not country," he says about today's version of the genre. "This younger generation has never heard of us." 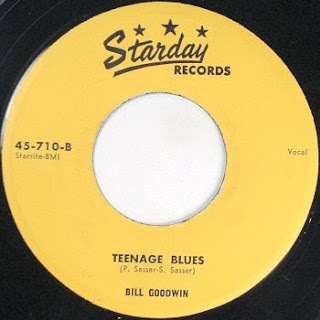 Ironically Goodwin's "Teenage Blues" has received a resurgence of interest, as rockabilly collectors search for obscure recordings. The record has appeared on two compilations, Country Hicks, Vol. 2 (Bark Log 2 - 1991), and The Lost Starday Recordings (Starday 218 - 1997). Copies of the original single have sold between $114 (2009) and $483 (2008), on eBay. Goodwin's 1958 recording of "Your Lying Ways" is also an in-demand collectible, selling on eBay for $200. Even Goodwin's "never got to first base" Band Box records have gained new appreciation. The single "Revenuer Man" would appear on the Swedish Various Artists Diggin CD in 2000.